You must take several steps before you are able to upload files to your server, and you can use both MinecraftPanel's online File Manager (Now supports uploading!) or you can use an FTP client. To use an FTP client you must first download & install one - There are many to choose from, but we reccomend FileZilla for ease of use and it's high quality. 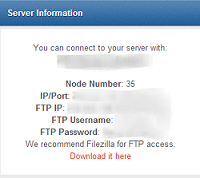 To access your server via FTP, you can use the information found on the right-hand side of your MinecraftPanel! - FTP IP: This is the IP you will use for FTP. Don't use your server IP as it may not work correctly. - FTP Username: This should be the same username as you log into MinecraftPanel with. - FTP Password: Use the same password you use to log into MinecraftPanel. - FTP Port: This information isn't on MinecraftPanel, but you should use port 21. This is FTP's default port and may not even need to be entered into the client. Now that you have logged in you may transfer files! In many FTP client's this is as simple as dragging one file from the pane on the left to the pane on the right.